Ricky Ian Gordon (b. 1956 in Oceanside, NY) studied piano, composition and acting, at Carnegie Mellon University. After moving to New York City, he quickly emerged as a leading writer of vocal music that spans art song, opera, and musical theater. Mr. Gordon’s songs have been performed and or recorded by such internationally renowned singers as Renee Fleming, Dawn Upshaw, Nathan Gunn, Judy Collins, Kelli O’Hara, Audra MacDonald, Kristin Chenoweth, Nicole Cabell, the late Lorraine Hunt Lieberson, Frederica Von Stade, Andrea Marcovicci, Harolyn Blackwell, and Betty Buckley, among many others. 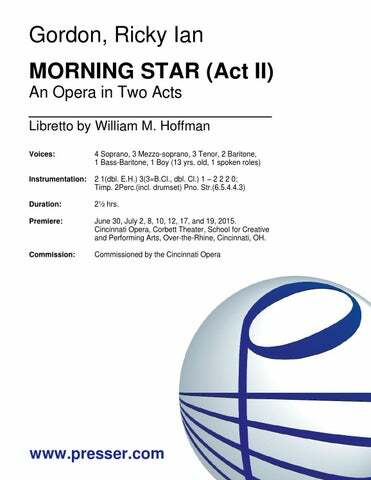 A highly prolific composer, Ricky Ian Gordon’s catalog includes Morning Star (2014, libretto by William Hoffman, premiered by the Cincinnati Opera) about Jewish immigrants in New York’s Lower East Side in the beginning of the 20th century; 27 (2014, libretto by Royce Vavrek, premiered at Opera Theatre of St. Louis) about Gertrude Stein’s salons at 27 rue de Fleurus; A Coffin In Egypt (2014, libretto by Leonard Foglia, premiered by the Houston Grand Opera, The Wallis Annenberg Center for the Performing Arts, and Opera Philadelphia) a haunting tale of memory and murder, racism and recrimination; Rappahannock County (2011, libretto by Mark Campbell, premiered at the Harrison Opera House) inspired by diaries, letters, and personal accounts from the 1860s; Sycamore Trees (2010, libretto by composer) a musical about suburban secrets and family; The Grapes of Wrath (2007 and 2010, libretto by Michael Korie, 2007 premiere by the Minnesota Opera, 2010 premiered by The American Symphony Orchestra); Green Sneakers (2008, libretto by the composer, premiered by the Miami String Quartet) a theatrical song cycle for Baritone, String Quartet, and Empty Chair; Orpheus and Euridice (2005); My Life with Albertine (2003); Night Flight To San Francisco and Antarctica (2000) from Tony Kushner’s Angels In America; Dream True (1999); States Of Independence (1992); The Tibetan Book of the Dead (1996); Only Heaven (1995). 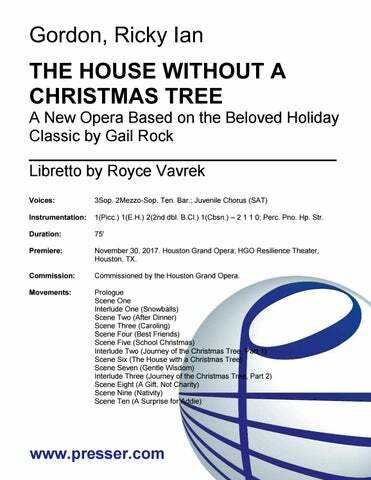 Upcoming and recent projects include the opera Intimate Apparel with Playwright, Lynn Nottage as a commissions from New York’s Metropolitan Opera and Lincoln Center Theater, The House Without A Christmas Tree (libretto by Royce Vavrek) commissioned by Houston Grand Opera, for a November 30, 2017 premiere, Private Confessions with Playwright, Richard Nelson, commissioned by The Goodman Theater in Chicago, Ellen West (libretto by Frank Bidart) commissioned by Beth Morrison Projects for a 2019 premiere, and an opera based on Giorgio Bassani’s novel, The Garden of the Finzi Continis with librettist Michael Korie. 40:00 Solo Sop., Solo Bar. ; Fl. Cl. Tbn. Pno. Vcl. Perc. For Baritone and String Quartet 1:00:00 Solo Bar. ; 2Vln. Vla. Vcl. 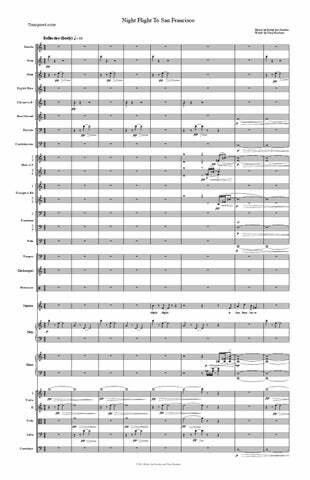 Version for Clarinet and String Quintet (or String Orchestra) accompaniment 1:00:00 Sop. Clr. Pno. Str. 5 Songs for High Voice and Orchestra on poems by e.e. cummings 21:00 Solo High Vx. ; 3(Picc.) 3(E.H.) 3(B.Cl.) 2 – 4 3 3 1; Timp. 3Perc. Hp. Str. Harper’s Monologue from “Angels in America” 10:00 Solo Sop. ; 2(Picc.) 2(E.H.) 2(B.Cl.) 2(Cbsn.) – 4 3 3 1; Timp. Perc. Pno. Hp. Str. For Chorus and Orchestra 1:00:00 2(Picc.) 2(E.H.) 2(Eb Cl./B.Cl) 2(Cbsn.) A.Sax. T.Sax. – 4 3 3(B.Tbn.) 1; Timp. Perc. Gtr. Harmonica. Synth. Hp. Str. 2:10:00 2(dbl. Picc.) 2(dbl.E.H.) 2(dbl.B.Cl., Eb Cl.) 2(dbl.Cbsn.) A.Sax. T.Sax.(dbl.Bar.Sax.) – 4 3 3(B.Tbn.) 1; Timp. 2Perc. Synth. Hp. Harmonica. Gtr. Str. A Theatrical Song Cycle about the Civil War 1:25:00 1(d.Picc.) 1(d.E.H.) 2(d.B.Cl.) 1 – 1 1(d.Flglhn.) 1 0; Timp. Perc. Pno.(d.Cel.) Str. An Opera in Two Acts after the novel by John Steinbeck (2015 Version) 2:40:00 2(2nd dbl. Picc.) 2(2nd dbl. E.H.) 2(1st db. Eb Cl. ; 2nd dbl. B.Cl.) 2(2nd dbl. Cbsn.) A.Sax.(dbl. S.Sax, Bar.Sax.) – 2 2 3(B.Tbn.) 0; Timp. 2Perc. Hp. Pno.(dbl. Cel.) Guit.(dbl. Banjo) Str. Opera in Three Acts after the novel by John Steinbeck 3:10:00 2 2 2 2 A.Sax. T.Sax – 4 3 3(B.Tbn.) 1; Timp. Perc. Synth. Hp. Harmonica. Gtr. Str. (The Great Liberation Through Hearing), an opera 1:45:00 Fl.(dbl. Picc.) Cl.(dbl.B.Cl.) Hn. Tpt. 3Perc. Pno. Hp. Vln. Vcl. Cb. If the music of Ricky Ian Gordon had to be defined by a single quality, it would be the bursting effervescence in fusing songs that blithely blur the lines between art song and the high-end Broadway music of Leonard Bernstein and Stephen Sondheim…It’s caviar for a world gorging on pizza. Gordon’s works crystallized the fundamental definition of opera – dramma per musica – as ancient as a lyre player trying to rescue his betrothed from Hades, as timely as the deeply personal loss of a partner from AIDS. 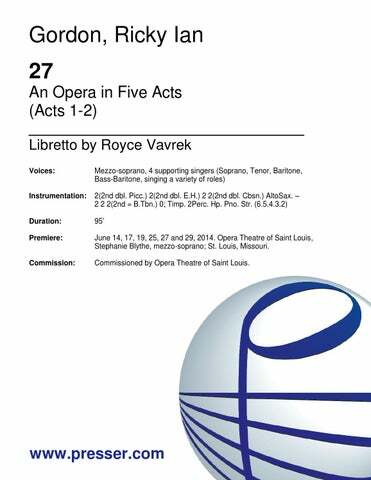 “27” is a triumph for Gordon and Vavrek and a tour-de-force for all of the performers. …a playful, quick-witted libretto that pushed Mr. Gordon beyond his trademark melodies into a brighter, friskier style. Balancing humor and the serious questions of human existence is a tricky business … Composer Ricky Ian Gordon and librettist Royce Vavrek … make members of the audience laugh, then force us to consider matters of life and death. …a taut, witty and affecting new piece of lyric theatre. This year’s fresh face in the repertoire is called 27 and like its title, the work is short; just 91 minutes first note to last. Other defining details: Five singers only, no chorus, in English, and entirely pleasurable. … Gordon continues the trend of synthesizing two forms that battled it out in the last century, classical and popular, and makes a stand that they can coexist. Rewriting European history with a charismatic, new world touch — that’s once and forever American. …marvelously grateful to the voice … the melodies are sweet..
…compelling… A Coffin in Egypts is a first-rate star vehicle for a first-rate stage performer. Although A Coffin in Egypt is technically a chamber opera, this stunning new work by composer Rick Ian Gordon also deserves the additional modifier of ‘Grand,’ for there is nothing small about it except for the forces required to perform it. Gordon’s natural-born understanding of how music works for the stage is readily apparent throughout. …an unqualified success that has a solid future in the operatic repertoire. Von Stade does a magnificent job of creating the character of Myrtle Bledsoe, but you can already see the line of mezzo’s forming to have a chance to bring their own unique abilities to what has to be numbered among the juciest roles ever written for the voice range. Over the past decade or so, I’ve seen new operas based on history, literature and contemporary life; A Coffin in Egypt … is the most compelling of the lot. …musical and emotional richness. Ricky Ian Gordon’s music has depth and substance, and he managed the difficult task of communicating Miss Parker’s complicated emotions while not obscuring the clarity of her words. One hearing does not do his music justice. Gordon’s songs were richly varied in soaring lyricism and inventive humor. Gordon’s music seemed perfectly matched to Parker’s sarcasm and quicksilver mood swings…there was a freshness and originality…one of Gordon’s 11 songs, “Lullaby,” was stunning. It is amazing that in this his first work for string quartet Gordon has perfected an idiom that goes to the edge of tonality to create a microcosm of pain and despair that has all the markings of a contemporary Gesamtkunstwerk. Indeed, at the premier, members of the Miami String Quartet were no longer mere strings, but humanized voices that formed a seamless dramatic unity with [baritone Jesse] Blumberg… With the repetition of “Sleep Dear,” the final words of Green Sneakers, one heard in Vail a distant echo of the “Ewig” that concludes Mahler’s monumental Abschied. For this is a song of today’s earth, a farewell lamentation that transcends death. A modern opera about one man and his grief, “Green Sneakers” resonates with its raw emotion. …This piece provides a sense of the individual that could speak to most anyone. …anyone who has lost a loved one to any illness can relate to “Green Sneakers.” Gordon’s heartfelt writing has no political tilt. It simply pours out of the feelings of love lost and the regrets that came along the way. … The music is flowing and unbalanced, just like life itself. It fit perfectly with the story being told. Gordon has a unique language. And he is extremely skilled, in that, his language can speak to you on any level and move you on one or more of them. Gordon knew instinctively how to have the quartet music go directly to your gut with or even without the need to relate to the staged poetry. Gordon also gives you the opportunity to relate to the music through the mind as the music is extremely expressive and can easily conjure up visual images. And there lies, for me, the true greatness of the work: all those levels and all those ways to experience it. It is a production that peers into the very soul, leaving behind a transformed and uplifted audience with each live performance. [“Orpheus and Euridice” and “Green Sneakers”] were similar in dealing with the same theme of greiving for the loss of loved ones, with an emphasis on music as a means of grieving and healing…Both works moved toward a common message, the role art can play reaching acceptance of deep loss. […] tragic …deeply moving… [an] intensely human work, rich… [with a] many-faceted score. …the freshest moment of the evening. …tuneful and poignant. … There’s little not to like about “Orpheus.” … this piece is set to a mood of delicate nostalgia: It limns the growth of love and anguish of loss as if it were a small flower that buds, opens, is plucked at its acme and pressed into a papery simulacrum of itself. Experiencing renegade opera and contemporary dance in a cemetery actually made what would be a gloomy environment, incredibly magical. … While this show was stocked with talent, a beautifully told love story, it was mostly about the experience. Don’t like opera? Who cares…go for the experience. [The] underworld was located in Allegheny Cemetery in Lawrenceville. I was there to see Orpheus guide his love, Euridice, out of a poetic hell in Opera Theater of Pittsburgh’s masterful collaboration with Attach Theatre, Ricky Ian Gordon’s “Euridice & Orpheus.” …I can’t imagine that there would be a better spot than this for the classic Greek myth. … This was an evening to reflect, enjoy and embrace art in an uncommonly artistic setting. With gravestones, mausoleums and monuments stretching out in all directions, a single clarinetist strolled, playing a mournful melody. And with that, a most remarkable operatic event began in a most unusual setting: Allegheny Cemetery. … “Orpheus” is intimate, about a couple, and updated. It would have been a joy just to hear the gifted composer (and librettist here) in another genre. … But Opera Theater director Jonathan Eaton…brought the two sides together in a production that was both personal and epic. It started with the location – by the lake in the cemetery – and came to full fruition by his expanding the story to include dancers to portray the characters. … What could have been gimmicky in the hands of lesser artists was an experience that many will remember. One of the year’s most moving theatrical events in any genre. Ricky Ian Gordon’s “Orpheus and Euridice” is so intimate and private that one almost feels intrusive commenting on it. … Both Gordon’s text and music are couched in an accessible idiom of disarming lyrical directness, a cleverly disguised faux naïveté that always resolves dissonant situations with grace and a sure sense of dramatic effect—the mark of a born theater composer. …Ricky Ian Gordon’s “Orpheus and Euridice,” was an outstanding evening of theatre and demonstrated unequivocally how powerful opera can be as a crossover art form. …gloriously stunning, heartbreaking and altogether brilliant… Ricky Ian Gordon’s music and simple text beautifully condense this timeless story into a 70 minute opera for soprano and clarinet that is effective in every way. I cannot recommend this more highly. …a remarkably unified work … a gut reminder of the timelessness of this ancient myth and its message about the fragility of trust. …hidden treasure. …a collection of highly characteristic pieces that combine Gordon’s unique musical language, innate feel for melodic lines and an intimate knowledge of the instrument. …pretty awesome. It definitely helped me gain perspective that I don’t think I could have found in a book or a battlefield. The piece has the sense of a lens closing in on a spectrum of individuals and their feelings around slavery and morality in a profound and poignant way … The acclaim accorded “Rappahannock County” by the 2,200 people who packed Norfolk’s Harrison Opera House for the premiere made clear that Gordon and Campbell had achieved their goal. 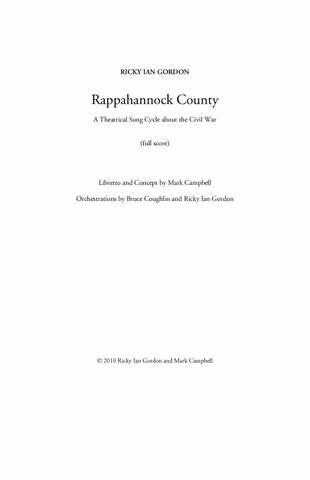 Campbell and Gordon have done a masterful job … the specific Virginia setting is incidental to the universal theme of war’s loss and hope, which is nowhere expressed better than in the finale, “Spring Will Return Again/Rappahannock”. …thoroughly professional, often moving and occasionally funny … Don’t be surprised if it becomes a programming favorite, especially in concert formats, among American symphony orchestras for decades to come. …highly entertaining… Mood and emotion run the gamut throughout the work and are dynamically paired by Gordon and Campbell. The lyrical content is honest and true to the times, though with hints of contemporary viewpoint. … [Gordon and Campbell] proved to be outstanding collaborators for what is likely to be considered one of the best musical theatre works of 2011. Gordon’s lyrical gift shines through every page of the score. … No wonder audiences erupt in cheers at the end. …the greatest glory of the opera is Gordon’s ability to musically flesh out the entire 11-member Joad clan … Gordon’s other great achievement is to merge Broadway and opera … greatly enhanced by his firm control over ensembles and his sheer love for the operatic voice. …a stirring, crowd-pleasing work that left the Carnegie Hall audience cheering on its feet. …on the whole Gordon and his librettist Michael Korie have created a major new American opera, one that is likely to stand the test of time. 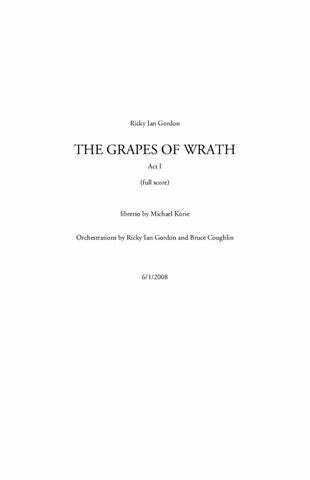 It must be said that “The Grapes of Wrath” certainly reached the audience on Monday night. The hall was packed and the ovation tumultuous. …packed as big an emotional punch as any opera I have ever experienced. … [Gordon’s] music has a very American feel that is altogether appropriate for the somber subject matter – and sorely needed in the world of opera. …[a] soul-warming recipe of mittens, snowball fights, caroling, secret Santa gift exchanges, friends, family, and love…just the thing, really, to usher in cheer. Gordon’s melodic, tonal score…fall[s] easily on the ears, often bringing to mind the late operas of Richard Strauss in its naturalistic setting of Vavrek’s dialogue… The pleasing score, congenial vocal demands and modest scale of “The House Without a Christmas Tree” give it a good shot at achieving staying power, attractive to professional opera companies of all sizes and to conservatories and universities. A succinct one-act piece… Gordon has written tuneful things that range through blues and gentle rock, cowboy rhythms and pop. The final chord-unresolved-provides a glimpse of eternity- one of the memorable things in this score. Gordon’s music is an eclectic, colorful and sassy stew of American pop, modernism and post-Puccini lyricism- a rhythm and blues torch song one minute, a sinister rendering of the nursery rhyme “This Old Man” the next. But it all meshes. The score surprises at every turn, but it never jolts. Moreover, Gordon draws a huge range of color and texture from his 11 instrumentalists… Gordon is a superb composer of songs-soprano Camellia Johnson closed her San Antonio recital last year with a magical Gordon set- and his vocal lines in this opera are unfailingly lyrical, sensuous and comfortable on the voice. When the dead woman finally sings-she soars in an aria of grand breadth and freedom. It’s a requiem that takes into account rebirth, which composer Ricky Ian Gordon handles with a litheness, occasional sly humor and an artistry that announces a creative rite of passage. Though highly melodic, the score has few traditional tuneful hooks, preferring to create a continuous musical organism that has many of the mercurial qualities of Olivier Messiaen. The music goes whatever direction it’s needed with a harmonic freedom and purposefulness… you’re aware of having taken an important musical journey. Music serves innumerable functions. It allows us to weep, to rejoice, to mourn, to celebrate. Or, in the case of Ricky Ian Gordon’s The Tibetan Book of the Dead, a liberation through hearing, to exorcise demons. At its Houston premiere, the cathartic impulse and function of the work resonated radiantly. …it revealed to Houstonians a composer with a facile but compelling gift for song. His opera was, to me, another exciting moment in the accelerating emergence of a collective American style of art music rooted equally in the country’s vernacular and cultivated traditions. … Gordon is a gifted composer. His opera contained several regally radiant songs- extended works that are a new format drawing from the sophisticated Broadway style of, say Stephen Sondheim, and the traditional aria form of opera. … The entire work cosseted feelings. The musical accompaniment was felicitous. … Gordon’s style was distinctive. Ricky Ian Gordon is best known as a composer of songs that are singable in cabarets, on concert stages, just about anywhere. He treats words-weather by Emily Dickinson or Langston Hughes-with tender loving care, wit, and once in a while, sass, but I can’t remember a saccharine or maudlin tune from him. All of which made him the right man to make an opera out of Jean Claude Van Itallie’s 1983 ritual-play The Tibetan Book of the Dead or How Not To Do It Again. Gordon, who used a composer’s prerogative and raised the ante of the subtitle by changing it to the more music evoking a liberation through hearing. … It’s emotional Honesty and increasingly affecting score will win lots of admirers. … Gordon’s ease with tonal tunes and harmonies stood up nicely against his shrewdly placed spikes of dissonance. Ricky Ian Gordon writes in the idiom most common among contemporary composers: eclecticism. This approach has the obvious advantage of freeing the artist from a stylistic straitjacket, but also carries the considerable risk of producing work that is meandering and formless. Gordon avoids that pitfall in “The Tibetan Book of the Dead” by stringing together spacious melodies, jazzy riffs, Stravinsky-like neo-classicism and even a bit of the blues within a unifying tonal landscape. … The most compelling aspect of Gordon’s music is his boldly colorful orchestration. More than a third of the pit orchestra consisted of percussion instruments, including xylophone, glockenspiel, timpani, snare, cymbals, tambourines, wood blocks, and gourds. A small string section, horn, trumpet, flute, clarinet, piano, and harp completed the lively ensemble. Gordon’s ability to balance this unusual combination of timbres is masterful. His sound is never overtly percussive, but fluidly adjusted for the theatrical needs of the opera. 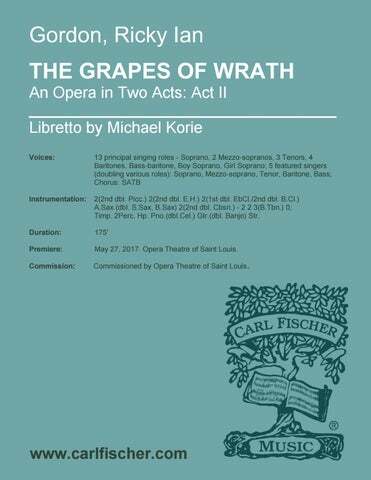 Gordon uses a somber kind of lushness as well as a glittery brightness to reflect corresponding dramatic elements in the libretto. 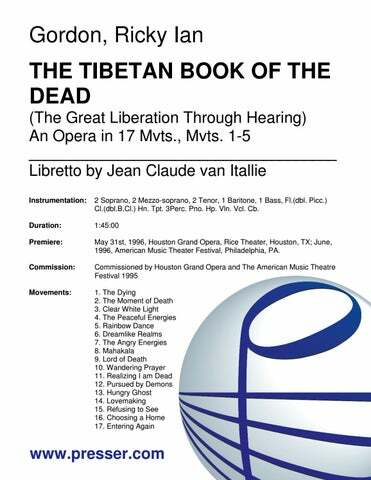 …thought-provoking, a meditation that ranges from forbidding to optimistic […] [and] leaves the audience with plenty to ponder: a heartfelt reflection on death as a vital part of life […] a rewarding and important entry in the contemporary operatic repertoire. …a stunning collection of Gordon’s settings of poems by Emily Dickinson and Sylvia Plath. Gordon’s songs resonate most strongly when interpreted with clear-voiced optimism and resolve, qualities that Zetlan possesses unequivocally. Her bright, shimmering timbre seems to propel the songs forward, as Gordon accompanies her on the piano with conviction and sensitivity to the nuances of the singer’s phrasing and pacing. […] Your Clear Eye boasts exceptionally beautiful music, and Zetlan’s steadfast, empathic approach to Gordon’s songs makes for listening that’s engaging and mesmerizing.